won't keep you waiting all summer long. Sunflowers come in a wide array of colors and forms, but the single-stemmed and branching types are known to excel as cut flowers. Many a first foray into gardening — whether in childhood or much later in life — has involved sunflowers. Sunflowers top our short-list because they germinate in under two weeks, require only a few months before they're ready to harvest, and consistently produce cheery blooms enjoyed by all. Sunflowers come in a variety of forms, including dwarf and perennial varieties, but for our purposes we'll focus on the two types known to excel as cut flowers — single-stemmed sunflowers and branching sunflowers. 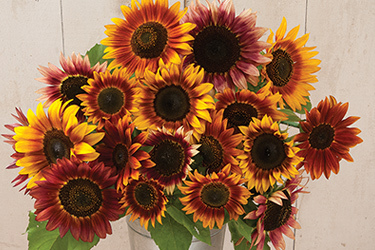 Scoring first-place for quality and reliability, single-stem sunflowers are a one-cut deal — producing one sturdy, high-quality stem per seed or plant. In addition to their easygoing ways and high-quality blossoms, single-stemmed varieties offer quick, dependable production time (relatively few days to maturity). They are also easy and quick to harvest — cut the single stem at your desired length and strip a few leaves — no need to bend over or reach up to hunt for stems. Single-stem varieties are available in a number of shapes and colors. The classic, golden yellow with dark centers are popular for bright or earthy high-summer and autumn bouquets, whereas those with green centers or lemon-colored petals are useful for fresh-looking spring and early-summer bouquets. The ProCut Series sunflowers are a favorite for their unmatched, fast production time, wide range of colors, and full, graceful booms. This variety forms bold, 8-inch broad heads on long, multibranched stems. While single-stemmed varieties have branching sunflowers beat for production speed, branching sunflowers offer two distinct advantages of their own. They produce multiple blooms per plant. These are very useful features if you are not sure exactly when you will want to harvest, or, if you want to harvest gradually over a more protracted period of time. Branching varieties are also valued for their greater diversity of colors, shapes, and flower size. Structurally, however, the stems of branching sunflowers are thinner, relative to their single-stem counterparts. We do our best to select for length and strength in the stems of our branching sunflower varieties in our trials, but it is important to keep this in mind when handling this group. A season-long harvest of sunflowers can be achieved by following a succession planting program. 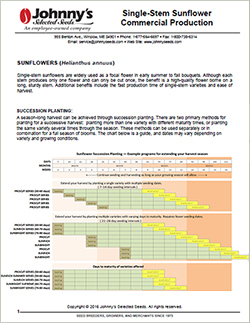 To help you learn how to succession-plant sunflowers using different varieties, we provide 3 examples in our Sunflower Planting/Harvesting Program Charts. 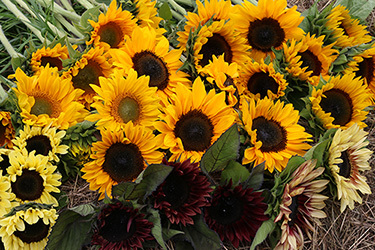 Because sunflowers — especially single-stem varieties — have a fast production time, both methods can be used separately or in combination for a full season of bright blooms. Zinnias are a diverse, versatile group. 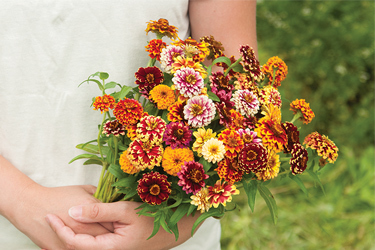 When you need dependable, low-maintenance cut flowers, think zinnias. They don't require special attention or conditions, just full sun and good soil. Even better, zinnias come in just about every color (except blue). There is a zinnia for just about every occasion, making them a useful cut for arrangements ranging from country to classic. Color. The color range of zinnia blooms is truly impressive — from the intense, high-chroma Benary's Giant Series to the delicate, subdued tones of Creamy Yellow, Oklahoma Salmon, and Queen Red Lime. Our trials have yielded up a wide palette of high-performing choices that will work well for you, whether you're into floriculture for business or pleasure. Size & Shape. Another plus for zinnias is the breadth of size and shape they offer. The large, 4–6" diameter giant dahlia-bloom and cactus-bloom types are the most well known for their grandeur and ability to easily fill out bouquets and bunches. At the other end of the scale, their diminutive counterparts are exceptionally productive, and light up bouquets with flashes of color. 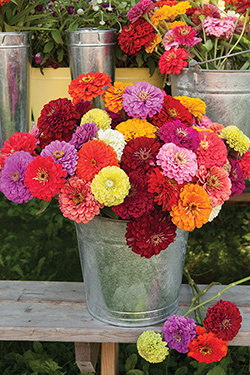 With 1–2½" blooms, the smaller-flowered or pompom types, such as Sunbow and the Oklahoma Series, are generally more durable, with sturdy stems and compact heads — and both are available in mixes that flower in a spectrum of colors. Disease Prevention. Zinnias are susceptible to some common plant diseases, such as powdery mildew and alternaria leaf blight. Keep flowers harvested and snip away spent blooms and foliage to diminish conditions favorable to these fungal pathogens, and to keep plants healthy and productive. 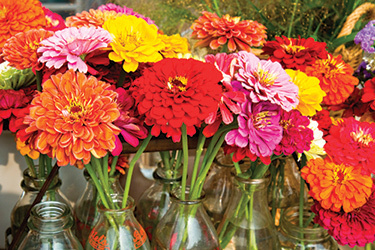 Zinnias typically continue producing blooms as long as the season lasts, and as long as the blooms are cut or trimmed away. That said, the plants can get tired after a time, reducing quality and quantity of bloom production. For a bounty of top-quality blooms all season long, we recommend two to three succession plantings, following your initial planting, each planted a couple weeks apart. The number of sequential plantings you can make depends on your growing zone and your particular requirements and preferences. Rudbeckia are every bit as productive as zinnias and a distant relation to both zinnias and sunflowers, all of which are in the Asteraceae family (see Big Happy Family). Rather than the upwardly, forward-facing petals of the sunflower, rudbeckia petals angle downward and away from the center, presenting their buttonlike disk at the flowers' apex. This is one of the key features of rudbeckia that make them so easy to utilize in bouquet work — and that put them on our short list. While they do have a higher number of days to maturity than sunflowers and zinnias, most of that period is devoted to seedling development. They will start blooming in July, from transplant, here in Maine, which is earlier than many other cut flowers. Color. Many of us know rudbeckia by the common name of their most common group, the Black-Eyed Susans, but the disc color of rudbeckias can also be green, brown, and in-between shades. The petals are sunny, warm, and dramatic in tone, ranging from chocolate to cherry red, copper, and gold. 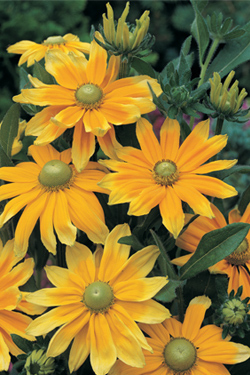 Brighter varieties offer a fresh appeal, with lighter yellow petals and green centers, as in the case of All-America Selections Winner Prairie Sun. Although categorically a tender perennial, this species is most often grown as an annual for cut-flower production, as first-year plantings are more dependable in most regions. Plants are naturally well branched, without the need to pinch out the apical bud. Rudbeckia hirta is quite susceptible to powdery mildew. Keep flowers harvested and snip away spent blooms and foliage to keep plants healthy and productive. 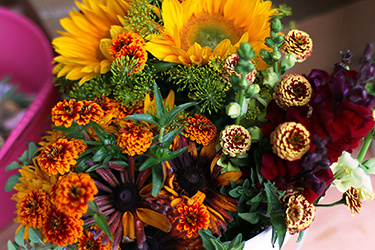 Arrangement Tip: Blooms (Rudbeckia hirta) with damaged petals can still serve as useful textural accents in bouquets by removing the row of petals to reveal the lovely green calyx surrounding the button-like center. This species is a tall, productive, branching perennial that produces sprays of multiple, button-sized blooms on strong, thin stems that are easy to harvest. 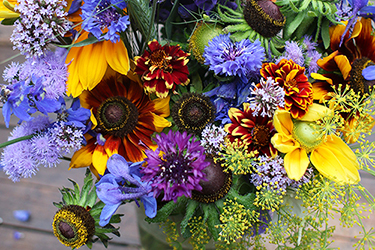 Blooming in late summer and early fall, Rudbeckia triloba makes autumn bouquets sparkle. Powdery mildew doesn't seem to be nearly as much of an issue with Rudbeckia triloba, which grows free of powdery mildew in our variety trials. This is just a glimpse at three tier-one heroines of the cut-flower garden. We chose this trio for their reliability, productivity, beauty, and relative low maintenance. There are many additional varieties you can consider for your particular needs. Make a checklist of features you look for in your flowers, or use ours as a short-cut. Here are a few additional resources to help you choose and plan an easy cut-flower strategy this year. 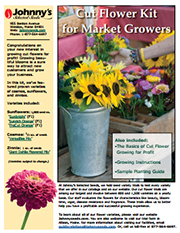 For anyone just getting ready to branch out and grow their business by adding flowers to the mix, we offer a Cut-Flower Kit for Market Growers. Here is our full selection of Easy-Choice Cut Flowers. Here is a complete list of our Cut Flowers. And for some quick inspiration, watch our Mason Jar Bouquet Video. All three of our Tier-1 Cut Flowers have an additional commonality — they are members of the Compositae, also known as the Asteraceae, or simply the Daisy family. The term composite refers to the nature of their flower head, or inflorescence, which comprises a central, often disk-like section of tiny, tightly packed ray florets encircled by the marginal petal-like ray flowers. This is one of the largest, most cosmopolitan families of flowering plants in the world. With an estimated 23,000+ different species in this family, you will see many variations in the configuration of the infloresence. And, while not all are a breeze to cultivate, they are on the whole a well-adapted family, in comparison to many other flowers — relatively carefree and forgiving in their demands.